Please visit the First Ever Picture Book Carnival by Mentor Text & More. I know I am so behind the times! I just read Lizzie Bright and the Buckminster Boy by Gary D. Schmidt and I loved it! There are so many levels to this book. It is humorous, historical, tragic, heart-warming, and well written. I can't believe another book that passed me up for so long. I picked up while waiting on my library to get the Wednesday Wars also by Gary D. Schmidt. I would recommend this book to a 7th or 8th grader, but I think you could read it aloud to 6th grade. WOW... I don't exactly know what to say about this book! One minute you will be laughing, the next minute thinking seriously, then crying, and maybe even raging. I cannot think of one bad thing about this book. That is probably why it won a Newbery Honor. There are a ton of reviews out there for this book that can give you idea of the plot, but I just wanted to say how much I enjoyed the book. What a beautiful book, Campy: The Story of Roy Campanella by David A. Adler and illustrated by Gordon C. James. I was eager to read this picture book about baseball and the famous Roy Campanella even though I don't know much about either, but especially because I don't know much about either. It is so very hard to find picture books to prove to 5th grade boys that picture books are not for babies. Adler, himself a baseball fan, tells the intriguing story of the famous Brooklyn Dodger Roy Campanella. The illustrator, Gordon C. James accompanies his story with awesome oil paintings. Adler is also the same Adler who writes the Cam Jansen series. Campanella's story is full of strive, triumph, and tradegy. This book has many lessons to be learned. It would come in handy if you were talking or reading about segregation by the way, because Roy Campanella is the second African American Branch Rickey signed right after Jackie Robinson. Without giving away the whole book if you do not know the story of Roy Campanella, part of the book has to do with disability as well. The back of the book contains Important Dates, Quotes, and Suggested Reading. I always love when authors do that at the end of nonfiction. It keeps us reading, and that is the point, never stop learning. A Year of Reading tagged me for this meme. I am a good teacher because...I love what I do and I have fun doing it. I thrive on making a community in my classroom and I want the students to know they can do anything, think anything, and ask anything. If I weren't a teacher I'd be a/an... Something in the beauty business... something to do with make-up. My teaching style is... Student-led and very inquiry based. My classroom is... Full of books, paper, writing, talking, working students, and me. One of my teaching goals is...to keep as much student ownership in the day as possible. We are being pressured to get rid of that in the name of testing and it is the way kids seem to learn best. Create a classroom community as quickly as possible at the beginning of the year. -- I am keeping both Franki and Mary Lee's answers. I agree with both! The toughest part of teaching is...You are never quite sure what your doing is the right thing until it is over and you can see the outcome. It is not as simple as "You do this...and this will happen." I love that and hate that. The thing I love most about teaching is...When a kid comes back and says "Remember when we..." Makes me teary every time! A common misconception about teaching is... It is 9-3 with summers off. LAWD, nothing could be further from the truth. And I am still not fully convinced that my husband doesn't think I sit in a chair and babysit everyday. The most important thing I've learned since I've started teaching is... Students learn through example and there is no better way than to read and write in front of them and with them. I am tagging CookieBooky and My Breakfast Platter And anyone else who feels like doing it. I have no idea who has already been tagged. Sometimes I have had a few comments from people and I can't figure out if they have a blog or are just commenting... One of life's mysteries, but I try to read everyone's blog who comments me. Back to regular blogging tomorrow and I have a super picture book to talk about! 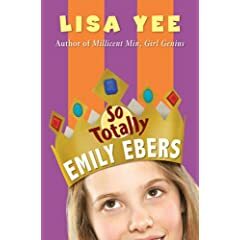 I really stretched my brain while reading So Totally Emily Ebers by Lisa Yee. 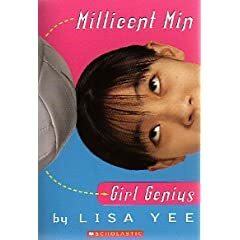 Not because the plot was difficult or anything like that, but I was had to think back to when I read Yee's first book Millicent Min Girl Genius. It is absolutely amazing the way Yee has written three books (The other being Stanford Wong Flunks Big Time) in tandem the way she has. I read the first book back in 2003 so it was kind of a stretch to think back and try to remember the character of Emily Ebers, the main character in this book. But don't get me wrong... you do not HAVE to read these books in order. No, No, No... 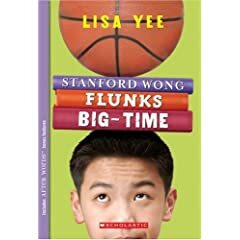 In fact Lisa Yee herself says the books "can be read in any order, any day of the week, and at any time, except when you're sleeping." However, I thought is was super fun to compare. I haven't even read the second book, but I will now. I highly recommend this book, especially if you have read the other two, but not only if you have read the other two. --You don't have to read the other two, but you will want to! 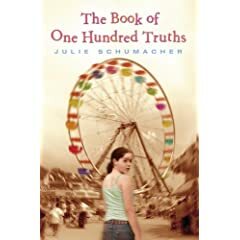 I am mad this book has gotten past me this long, The Book of One Hundred Truths by Julie Schumacher. I am so glad I found it. The book is perfect for 5th-7th grade students. The main character, Thea, is just like any troubled 13 year-old. She is holding on to a dark secret and using lies to help her along the way. It is summer and she is off to spend time at her grandma and grandpa's house at the beach. As she is ready to take off, her mother gives her a notebook and asks that she try writing down some truths in it. (Obviously the mother has seen through her lying ways) When Thea gets to her Nenna and Granda (Her names for grandma and grandpa) she finds she is not alone. In fact the house is full for the summer and Thea is struggling with this. The plot to this book is so multi-layered. I thought the author did a wonderful job creating each of the characters with all of their layers. It was my favorite type of book because I could not stop reading. Every page, I had to know. There is a suspenseful situation to the story and I know it will hook in any reader. The "truths" Thea writes in her notebook build the suspense of the story, yet there is so much else going on as well. Check it out! I feel you won't be disappointed. I plan to look at other books by this author. I was so excited to find this brand new picture book at my library. The Chicken Chasing Queen of Lamar County by Janice N. Harrington and pictures by Shelley Jackson will definitely be used in my class this year! And from reading around, I am not the only one who thinks this picture book is a hit. Case in point, this entry on Chicken Spaghetti. The most beneficial part of this picture book for my students will be the author's style and the beautiful way Harrington uses imagery through literary techniques and voice. The book is written as a first person narrative and the narrator is a young African-American girl from the south. I knew this would be a perfect picture book when I read the first page and the main character said "Soon as I wake up, wash away the dreaming, and brush my teeth whiter than a biscuit..." Isn't that perfect? All throughout the book the author poetically uses similes, metaphors, personification, and onomatopoeia. "Plump as a Sunday purse," "quick as a flea bite," "Peckity-scratch-peck, "Molasses-easy," and "Molasses-slow." Those are just a few of the flowery language of the book. This will be perfect for that ONE tricky area when getting students ready for the 5th grade Ohio Achievement Test, figurative language. (Notice I capitalize one because that is all there usually is, one question) They never seem to understand this concept. And I must admit, I find it hard to distinguish the difference sometimes too. I must mention the pictures in the book. The illustrator, Shelley Jackson, uses a wide array of styles, including some collage. I think it is BEAUTIFUL! I am no expert, but the illustrations really made this book pop. It also fit the setting perfectly. If you haven't seen this book, check it out, you won't be disappointed. 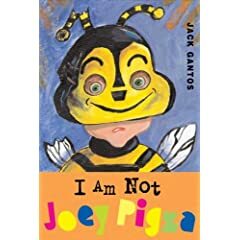 I have long been a fan of Jack Gantos and his Joey Pigza series, and there is now a brand new book, I Am Not Joey Pigza. I cannot believe it has been 3 years since Gantos has written a book about Joey. This year some of my students listened to Joey Pigza Swallowed the Key and Joey Pigza Loses Control. They thought both were great. They related to the main character Joey on so many levels. I thought it was neat that after listening to the first book the students were so excited they demanded I get the second book on tape as well. The third book is titled What Would Joey Do? As you know, I never like to give hints to the plot of the story, so you will have to read to find out if Joey and his mother follow along with the scheme. One thing that was missing from this story was the wacky grandmother, Grandma Pigza, who is in the other stories. She has passed away from her horrible smoking habit. I missed her in this book. She really brought out some goofy behavior in Joey. Another slightly disappointing part of this book is the fact that Joey is suppose to be in the sixth grade, but his character tends to still come across as a third or fourth grader. I know he is suppose to be very immature, but for Joey to hold the interest of repeat readers of the series, it seems as though he would need to have some of the issues of a twelve-year-old. The plot lends itself to a sequel so I will be keeping my eyes peeled. It's Me, It's Really Me! It's me, and I can't believe she did it! It is awesome. She is so kind. I am so honored. I am having so much fun, I hope it never ends. I know it seemed as though I had vanished again, but if you notice I am taking breaks on the weekend. As the summer moves along, my book reading is moving slower and slower. I apologize for that. So this weekend I read My Life in Flashcards by Charise Mericle Harper. I thought this was bar none the cutest teen book I have read all summer. For the most part I keep finding myself reading books about boys, so it was good to get into one where the main character was a girl. Again we are reading along with a middle-schooler who is going through all those middle school things (boys, friends, parents, school, etc.) Something that makes this book a little different is the main character, Emily, received a set of flashcards from someone she calls Aunt Chester (not really her aunt or named Chester). The flashcards have labels on one side such as: Friends, Kiss, Hate, Embarrassment, Food, Love, Clothes, etc. and on the other side you are suppose to write or draw pictures about yourself and those topics. Is that not a cool idea? I wonder if it really exists? I am sure someone has thought of it. I loved how there were lots of drawings, check lists, and diagrams that look to be made by the main character, Emily. It helped to make the book flow and seem very realistic as if a teen were telling the story herself. I noticed the author, Charise Mericle Harper had also written a graphic novel. 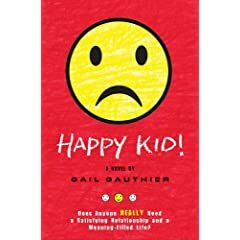 I would not be able to read this book to a fifth grade class, it had some subjects that were very much middle school but not so much fifth grade. Again, and I feel like I am starting to sound like a prude, there were some cuss words I wouldn't be comfortable reading aloud. I have never felt this way about books, but what is up with using a word like -- the "B" word in a children's book. I know it is realistic and teens use it and hear it, but that totally ruined me suggesting the book to any fifth grader in my class. Although I will for sure put it on my shelf and hope someone picks it to read anyway. I guarantee this is not the end of Emily. This book lent itself perfectly for a second one. And please note I am skipping in the play... I am so very proud of myself, I haven't skipped in years! I know Olive's Ocean by Kevin Henkes is not a very new book or anything, but I just got to it. I am so glad I did! I really liked this book. I absolutely loved the way Henkes dealt with the subject of life and death and how fragile life is. I thought the young girl was so believable and so genuine. The book also taps in on a topic that I myself would have related to at Martha, the main character's, age. (Puppy love and the disappointment of an immature teenage boy's idea of fun) I thought the family of the book was realistic even though the father was a stay-at-home father, which is not the norm. I thought the dynamic of a father who was torn between following a dream or providing for a family, and the mother who was a little over-worked would ring true for many families today. The writing in this book is some of the best I have read this summer. Kevin Henkes has a wonderful way with verbs and drawing the reader into each and every sequence of the story. That being said, I have to admit I felt the ending was a little abrupt and I would have liked to have seen more of the plot line resolved. I also felt the cussing in the book and some of the more risque topics might be a little too much for a fifth grade student. Although I would not hesitate to recommend it to some of my more mature readers. Just kidding, but I am finding it hard to talk about this book. I thought it was witty and funny and it captured the essence of a seventh grader who is a little unsure of himself and his abilities. Maybe I have just read too many books recently where the kid is a middle school "loser" in his own eyes. I just thought it was very unrealistic that this so called "unmotivated" 13 year-old would venture into reading a self-help book that was a gift from all people, his mother. Give me a break! Ain't gonna happen. Period. One part of this book I did get into was the subplot of the State Assessment Test they had to take. (aka "The SSASies") Ha Ha, pretty funny. The fear the teachers had of this test (ie passing out practice sheets the first day of class) to the fear everyone had when it seemed there could have been some possible shady doing's prior to the test (ie a teacher gave a practice question that ended up on the test) Now these events I could relate to. These are the things middle school teachers worry about. I also liked the fact that the main character, Kyle, was in accelerated classes. He felt, and even his family felt, he had put there by mistake. It turns out he had not. I related to the feeling of overwhelming dread Kyle had for those classes. Feeling as if he could never live up to the position and as if he was always 2 steps behind. The feeling of not being sure whether you should stick by old friends from elementary school, or try to fit in with the new group of "smarties" to which you were now a part. All and all I would recommend the book. There was a lot going on that I felt didn't belong, but there was too much of it to even get into. If anyone has read this book and fears I am not giving it a fair chance, feel to comment and give your opinions. I just may be too far out of it to understand. I will stand to be corrected if I am in fact being too critical. I promise I am not getting lax on my blogging, but I have been having severe computer problems and so I am only able to blog when the problems are at bay. I found it to be quite funny and entertaining, just like the first Clementine story. I can so relate to Clementine's problem in this story, which is to find something she is good at, her "talent" for the talent show. I always felt and still do, that I did not have a talent. Or at least one that could be performed for all to see. Some people might say Clementine is too similar to Junie B. Jones and the like, but I think there is something much more special with Clementine. Or possibly it is just that the writing seems better. I would compare Clementine to more of a Ramona Quimby. I do think some of my students might like this book, but I think I would just stick to the first book to read aloud. One thing I didn't understand is why Pennypacker didn't do something with Clementine's talent for art? Why didn't she use that as a talent for the show? That is a talent I would love to have any day. 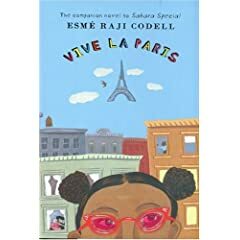 I have been wanting to get my hands on Vive La Paris by Esme Raji Codell since it came out, but for some reason I kept forgetting. You know when you are thinking of doing something and 20 other things happen in the "in-betweens" (a la Moxy). That was the case here. This book has so many layers. Yes, it has Codell's humor, but it is speckled with sadness and seriousness. There are many topics that I feel may be lost on a fifth grader, but are still very central to the book and honestly, you never know what is going on in a fifth grade student's life. They may find it right-on and understand everything the book is trying to say. When I say topics, I mean the least of which is the comparison of segregation and the Jewish Holocaust. If that tells you how serious this book can get. One of the most poignant themes in the story is "ignorance is no defense." Boy! is that a good lesson in itself. My second favorite part about this book is the French and Paris references. My grandmother was a French teacher and her first and only love was Paris. She passed away last summer so it is always fun to have a little remembrance for her every once in awhile. So today I will be talking about a book I read at the very beginning of summer. As a matter of fact, I read it before school was out and then read it to my kids. 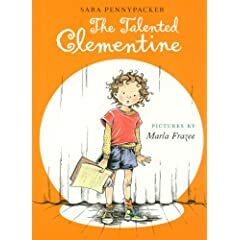 The book is Clementine by Sara Pennypacker. They pretty much thought it was funny and cute, but it was also the last two days of school and they could have cared less what I was reading to the class. I am surprised no one jumped up and yelled, "Shut up, lady! We have heard enough of your reading for the year." But they were a polite group and let me read and laugh to myself along the way. I must admit, again, I got the idea to read this book from A Year of Reading. I get all my great ideas from that blog, apparently. It is very true as Mary Lee says, that this book would be off the radar for my fifth grade students. But I am glad I introduced them to the book. This is my worst ever post, but my laptop is still going on and off, so I am in a really stressed out place right now. I will do better tomorrow. The first time I saw Diary of a Wimpy Kid by Jeff Kinney in the book store, I was skeptical. I picked up the book and saw that it had cartoon pictures and diary entries and I thought, sounds like a good idea... but is it hokey? After seeing it reviewed on other sites, I decided I should at least give it a chance. And good thing I did. I thought it was hilarious! Come to find out, the main character, Greg Heffley, has been around for awhile. The author Jeff Kinney is really involved with online game development and originally developed the character Greg for a Web comic. This book was originally a web book. 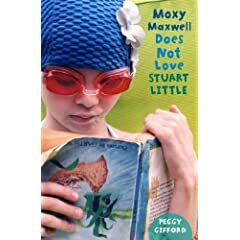 Moxy Maxwell Does Not Love Stuart Little by Peggy Gifford was a suggestion I got from A Year of Reading. I am so glad I finally read it because I did love Moxy just as much as Franki said I would. I kept waiting for it to come to my library, but it was on a waiting list, so I decided to just purchase the book. GREAT IDEA! I love the character of Moxy because she so reminds me of myself. I like to do what I like to do, when I like to do it. Moxy can think up 20 things to do "in-between" doing 20 things. Moxy is also very good at bossing around. --Love that. Also, Moxy Maxwell is a synchronized swimmer. I always wanted to be one of those. (There was a documentary on PBS just last night about synchronized swimming) I feel I may have even been the same way about Stuart Little when I was Moxy's age. I can't remember exactly but I am pretty sure my mom kept telling me I would like it and I kept putting it off. Then when I read it, I loved it. I would be very remiss if I did not mention Valerie Fisher, the illustrator of the book. Her illustration are actually in the form of photographs. They really make the book. Excellent idea. The book is a quick read, one bath time for me. Check it out! I will be reading it to my class this year. The day I have been dreading for the entire summer came yesterday. Late last night as matter of fact. I purchased Marley: A Dog Like No Other by John Grogan at the beginning of the summer. I started to read it, but somehow I got the idea, or heard, or something that the it was the whole life story of the dog.... So, I knew that in the life story of the dog there would be an inevitable end. This freaked me out so much, I put down the book and wouldn't pick it back up. Everyday, up stared that cute little Marley dog on the cover and I knew I couldn't put it off forever. In my boredom last night, I broke down. I picked up the book and there was no stopping me. I laughed, I thought, and at 1:30 a.m. I bawled as if something tragic just happened to me. I cried so hard my Marley, Rizzo, had to come see what was wrong and lick away my tears. On a side note, I am now obsessed with a mission to find out something about John Grogan. I had an awesome professor in undergrad and graduate school at the University of Dayton named Patricia Grogan (Pat) and I just have this weird feeling she is related in some way to John. I don't know why I have that idea, I just do, and I am going to continue searching. I don't know what it is, maybe it is me, but another one of my very favorite authors of all time is letting me down slightly. Christopher Paul Curtis's book Mr. Chickee's Messy Mission is not my favorite. When I read the first book Mr. Chickee's Funny Money, I thought... Okay? I didn't love it and I didn't really understand it, but it was still humorous. 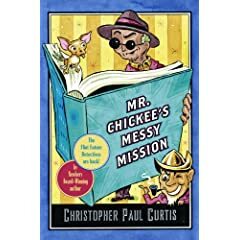 Now I have read the second book, Mr. Chickee's Messy Mission and I am saying... NO, not that good! I very much love the humor Christopher Paul Curtis brings to his writing. I just do not understand the point of these two stories. This book in particular gets WAY OUT THERE. It is like Curtis is trying to write to a certain demographic and it is not his style. He seems to be trying to capture the demographic of kids who want to read fantasy. I just really feel like he is so much better at realistic and historical fiction. 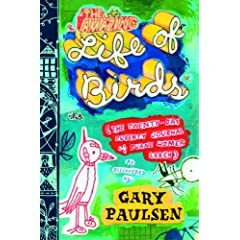 I was really ready to love this book, The Amazing Life of Birds by Gary Paulsen. Unfortunately, not so much. I know there is a niche for this book, but I am NOT in it. I still love Gary Paulsen. I still really love his writing style. I still think there is no one better for presenting a boy character in all his glory. But, saying that, I must say this book had WAY TOO MUCH information. I could never read this aloud or even recommend this book to a young boy. I would be so embarrassed. Still, I must say there are hilarious parts to this book, and I know boys would be into it. Especially because it is very short. (96 pages) OH YEAH, the title comes from the main character Duane "Doo Doo" Homer Leach comparing his life to the small growing bird he sees outside his window. Let's go with a little non-fiction! 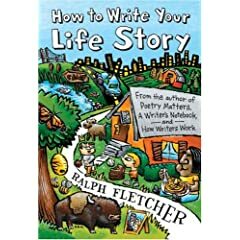 How to Write Your Life Story by Ralph Fletcher is perfect for my class. I really like everything Ralph Fletcher. I use his A Writer's Notebook and How Writers Work every year for my writing workshop. Fletcher has the perfect way to explain to kids the processes of writing your thoughts. 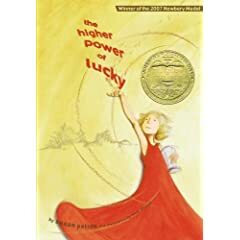 The Higher Power of Lucky by Susan Patron is another book I read right at the beginning of the summer. Thus, it is hard for me to remember things I wanted to say about it. I liked the book. It was another one of those books that the hype may be bigger than the story for me, but still very well written. This book particularly hit home for me when I read it for personal things which were occurring in my life at that moment, and I am sure it could for any student too. As for the controversy over the use of the phrase "scrotum" in the book, I say "GET OVER IT!" At least Susan Patron uses the correct terms for the word and not some slang, disgusting, over used word. I have been so tricked by this book for so long. It was a a case of judging a book by its name with The Schernoff Discoveries by Gary Paulsen. I honestly thought it was like a mystery book or something, and I just wasn't interested. Each and every year for at least 7 years, I have read aloud Harris and Me by Gary Paulsen to my fifth grade class. It is one of my all time favorites. The bad thing is, it is my sister's favorite book as well. Why is that a bad thing? She teaches the same kids, plus some, in seventh grade. Some years she reads it to her class as well, and those kids who have heard it in my class just suffer along. Harold and "Gary" are social misfits in high school, or so they think. Harold has many wonderful ideas on how to overcome this problem. "Gary" follows along with most of the ideas but they usually don't turn out exactly as planned. As I said in a past post, I have this infatuation with Richard Peck books, so I saw this book, Past Perfect, Present Tense and I could not pass it up. I am so glad that I did not. This book contains some of Peck's original short stories. The stories are perfect length for read aloud. There is something for everyone in this book. Humor, mystery, tragedy, history, and purely engaging literature. Some of the short stories included are the stepping stones towards some of Peck's famous and award winning novels. What I like best about this book is at the beginning of each section, "The First," "The Past," "The Supernatural," and "The Present," Richard Peck gives his thoughts and ideas on how the stories came about and where they are going next. There is also a section at the beginning titled "Introduction" which tells a bit about the form of writing, short story. At the end of the book there are sections titled "How to Write a Short Story" and "Five Helpful Hints." How awesome to have your own minilesson on short story presented from a real short story author. I can't wait to use this book with my class! Cedar B. Hartley is a 12 year-old daughter of a hippy-ish widow. She has an older brother who has run away. Her father passed away when she was very young. (The "how" of this comes out later in the story) Cedar enjoys making interesting observations of the world around her, and believes she will "live and unusual life." She meets a boy with an unusual talent and he helps her towards her goal of being "infamous." One thing that I like about this book was the different characters. They are all very unique including, her vagabond brother, "the boys" who live next door and have adopted a baby, and Kite, the acrobatic boy who has been in a circus. Another thing that was helpful about the book was the glossary for the Australian slang Cedar uses throughout the book. Gary Paulsen is my ALL TIME FAVORITE author. This brand new book, Lawn Boy was no exception. In fact I liked it so much I passed it on to a family friend's son to read. Gary Paulsen is so good at capturing the feel of teenage boys. In this book a boy's unconventional birthday gift from his grandma, an old lawnmower, proves to be a REAL money maker. 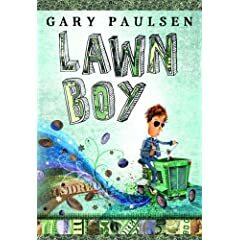 If you don't believe that a teenage boy could become a mogul from a lawn mowing business, check out this book and see how he does it. Although I loved this book, it is not a read aloud for fifth grade. As I said before, I passed along to a 12 year-old and I am certain it will be perfect for him. I do think some of my more capable readers could tackle it, but I like it better for sixth or seventh grade. It is a very quick read, only 96 pages. As I said in a previous post, I read this book a little out of order but it didn't really matter! 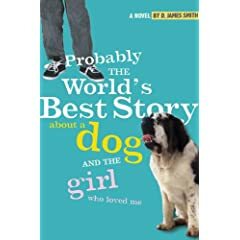 (I love that) Probably the World's Best Story About a Dog and the Girl Who Loved Me by D. James Smith. The second book about Paolo O'Neil finds Paolo, his cousin, and the rest of the large O'Neil family during the summer of 1951. Paolo, his deaf cousin Billy, and even Paolo's little brother Georgie, to some extent, have begun a paper route. This story, like the first, The Boys of San Joaquin; it has a mystery to be solved. Unfortunately, that mystery is a little less a part of the plot as I would have hoped. However, I don't love LOVE mysteries so it wasn't terrible. This book also had a bit of romance in it, in the context of 12 year-old love... if you consider that romantic. The editorial review on Amazon.com from School Library Journal claims that some of the American Sign Language descriptions included in the title of the chapters are "contextually inaccurate." I have no idea if this is true or not, as I do not know sign language. Maybe it has something to do with the fact that the book is set in 1951 and some of the signs have changed??? Who knows. I recommend this book anyway. Rules by Cynthia Lord! You have got to read it! I absolutely loved it. Sometimes the hype on a book is more than necessary. I found this to be untrue for this book. Catherine, the 12 year old main character struggles with the fact that she has an autistic brother. Her feelings are so real and raw. They are the struggles many 12 year olds have compounded by the struggle of having an autistic family member. Not only that, but Lord does a wonderful job of sensitively presenting disability. This is a book I would want my students to read on their own. I think it would be nice for a read aloud, but even more thought provoking for students to read on their own and form their own opinions. I would love to hear their thoughts on how they would act in some of the situations Catherine finds herself in during the course of the story. Is anyone reading this? I would love to hear from you. I am trying to think of how to get more readers to my blog.